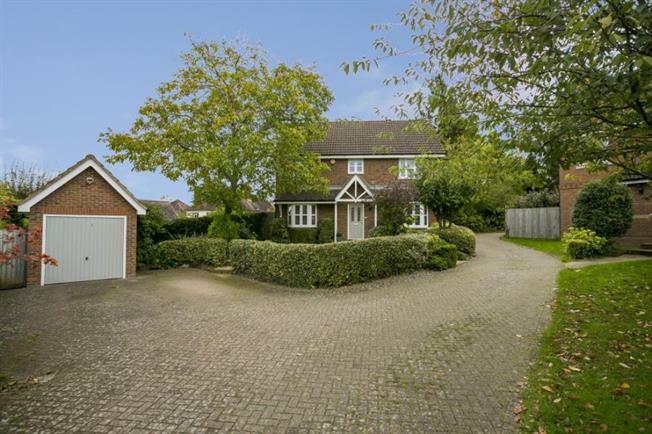 4 Bedroom Detached House For Sale in Tonbridge for Offers in the region of £875,000. Set over two floors, the accommodation comprises of a spacious entrance hallway, extended sitting room with good natural light and double doors to the garden, downstairs cloakroom, dining room with bay window, and a double aspect kitchen breakfast room with a range of integrated appliances and separate utility room. Stairs rise to the first floor where there is a master bedroom with en suite shower room, three further bedrooms and a family bathroom. All the bedrooms have built in wardrobes. The property is approached over a private driveway providing parking for several vehicles and access to the front garden and detached garage with electric up-and-over door. The rear garden wraps around the side of the property and is mainly laid to lawn with mature hedge borders, numerous flower beds, mature shrubs and a delightful patio area adjacent to the house. Tonbridge is a thriving market town that has developed over the centuries. It boasts a fine example of a 'Motte and Bailey' Norman castle built in the 13th century, set on the banks of the river Medway with the castle grounds abutting Tonbridge Park offering covered/open air swimming pool, tennis courts, children's play areas, miniature railway, putting etc. Tonbridge Town offers an excellent range of retail and leisure activities with many High Street stores and a full complement of banks and building societies, together with a selection of coffee shops, restaurants and local inns. The mainline station provides fast commuter links into London (Cannon Street/London Bridge/Charing Cross in approximately 40 minutes) with road links to the M20 & M25 motorways via the nearby A26 and A21. Tonbridge offers first-rate primary and secondary schools (including Grammars and Public Schools) many of which consistently do well in the league tables.